“That is the puzzle to solve, you see,” he continued, “it is like Dr Jekyll and Mr Hyde,” using a more tangible example that I could understand. Now, HillTop is on the banks of Long River. The left, where Thevaram was based, we shall refer to as the yakada (steel) side, in recognition of the type of scholarly activity pursued there, and the right shall be called the gemba (frog) side, following the untidy yet beautiful cafeteria which was infested with the amphibian. It was usual for young Thevaram, after long days of yakada bashing and solving calculus problems on how hard the bashing had to be to achieve the desired shapes, to cross Long River and relax at the gemba cafeteria. Sipping tea, he observed Nee Hou Ma, also a student, perhaps a couple of years older and following a course on the gemba side of campus. “To be honest, I was quite envious of the guy then,” Thevaram said in the pub, after finishing his second pint of Peroni. “Why so? Nee Hou Ma was just another student, wasn’t he?” I wondered. “There were three things about Nee How Ma I observed,” Thevaram explained. “He borrowed lots of books from the library and carried them in a sling bag, and he was always accompanied by a young lady of exceptional beauty.” I wasn’t surprised. For someone spending most of the day with machines various descriptions bending and twisting metal into shapes, and having to do the theoretical calculations on them, to see someone having the chance to read the wonderful works of Karl, Antonio and Ludwig might have been a source of envy. Thevaram flatly denied that the scholarship of the gemba side chap upset him in any way. After all, the occasional witty remarks of those who taught him thermodynamics and power systems, coming from the Left, were of such great educational value, not just of the mechanics of yakada, but also of the societal evils around us. “No, Sir!” That suggestion too met with a flat denial. The Bridgetown bar was no place for confessions on cultural baggage. “You said there were three things you observed about Nee Hou ma, what was the third?” I asked. “Yeah, he always carried an umbrella, machan. A big umbrella that protected him from the rain in the hills, you know the one that can serve multiple purposes, of the right length to serve as a walking stick, had a sharp end that could be used to defend yourself if attacked and had a curved handle with which you could even use it to pluck low-hanging fruits. A decade or so later, having been exiled among Bridgetown’s artificial intelligentsia, Thevaram arrived back home on a scouting trip to assess if it was time for a permanent return. “Big jump, no, how did the (far) Lefts suddenly turn (far) Right machan?” I asked. “You see, you are making the mistake of thinking of the Left – Right political spectrum as linear, machan,” Thevaram explained. “That is not a straight line. It is curved like a horseshoe. So, when you go further to the left, beyond a point, you are actually moving closer to the right, machan.” That was beautiful. All you needed to explain the peculiar jumps was to view the political axis as a curved line. That was the differential geometry of politics. Eureka! Back at home, Thevaram turned on the television to watch the news broadcast. He saw President Slaveoflove addressing the opening session of Parliament which had been closed for some time following an impeachment motion put against him. “You guys thought you can throw out the Banana Gardens man, you guys thought he can’t re-open the universities again, you guys thought he can’t teach the rebels a lesson and put them down! Look what I have achieved” Slaveoflove deviated from his prepared script and thundered. Thevaram wasn’t pleased. “Tens of thousands were murdered in cold blood, not much of a record for you to boast about,” he shouted back at the television. Would you say that Hou Ah Yu’s current political affiliation has something to do with his peculiar epi-genetics? The genome of the Paras are the same. It is the Para-lies and brainwashings that dives behavior. These ‘Nee Hou Ma/Hoo Are You’ types of former far leftists allegedly turned rightists are strange guys. They seem rightwing only to certain categories of folk, while they are accepted as leftwing by…the global leftwing. Take a quite similar chap, DJ. Just a few months back (i.e. several decades after he was supposed to have turned rightwards according certain categories of Sri Lankans)on the 90th birthday of Fidel Castro, he was interviewed by Venezuelan TV TeleSUR, a station co-founded by Chavez’ Venezuela and Fidel’s Cuba, Daniel Ortega’s Nicaragua, Rafael Correa’s Ecuador, and Evo Morales’ Bolivia. One supposes that TeleSUR could have reached out to so many Asians or Sri Lankans who were of the left rather than the right, to have interviewed substantively on the subject. And yet, they picked this turncoat ex-leftist. “In contrast to generally condescending appraisals in the West, I call attention to two extraordinary essays of appreciation written by cherished friends. One by Sri Lanka’s lead diplomat and cultural critic, Dayan Jayatilleka, published as an opinion piece in the Colombo Telegraph beneath a suitable headline, “A Farewell to Fidel: The Last of Epic Heroes,” Nov. 26, 2016. Dayan not only celebrates Castro’s heroic revolutionary achievement in transforming Cuba from its gangster state identity in the Batista period to a vital outpost of Third World progressive ideals. He also underscores the admirable ethics of liberation violence that guided Castro’s revolutionary practice in ways that exhibited disciplined respect for the innocence of civilian life. For greater detail see Jayatilleka fine appreciative study, Fidel’s Ethics of Violence: The Moral Dimension of the Political Thought of Fidel Castro (London: Pluto Press, 2007). This conception of the ethics of political violence has been essentially absent from the manner in which the struggle between terrorist groups and sovereign states has been waged in various combat zones, especially since the 9/11 attacks. Jayatilleka’s assessments have been confirmed and extended in the recently published book by Nick Hewlett entitled Blood and Progress: Violence in the Pursuit of Emancipation (Edinburgh, Scotland: University of Edinburgh Press, 2016). So the question, as Mahesan Niranjan puts it is “WHY?” or rather, HOW COME? From Venezuela to Princeton, could it perhaps be…epigenetics? Sinhala racists were defeated in London. Details will follow. This should happen in Srilanka for the sake of peace and harmony. Perhaps Sri Lanka, with its Putin admirers, has the best intellectual hookers. But some people from the obscure ‘global left’ in search of temporary relief, are still engaging the gigolo. Proud of that engagement, the gigolo drops their names all the time, as he does here. Thanks DJ for clearly and unambiuously identifying yourself. For a moment I wondered who DT was, thinking that it may have been a local Leftist leader of days of yore. Then I saw that Arooran had named Donald Trump. But Dayan J. has got himself so well known through his idiot box performances that all readers would have identfied him. However, many a Sinhalese villager still imagines the guy is worth listening to. It’s good to see him discrediting both himsef and the Jarapakshasas. Hou Ah Yu’s political affiliations vary according to the prevailing political climate. Like a cat flap, he is able to swing both ways. Good thinking and Beautiful writing. Horseshoe theory, may be thats the way certain brain cells release strain in the yakkda system. once the intellectual system get saturated gemba genomic remnants gain control and cause silent splitting to serve the survivor.Thank you. It is really funny to see DJ respond to the piece as Donald Trump (DT) does to criticisms, as his ego did not allow him to ignore it, as he knows that he was the caricature in the piece. Those who are interviewing him for his work on Castro do not have any idea what his political role at present in Sri Lanka. Like DT, DJ is also a similar type of snake oil salesmen but intellectually far superior. Many working class people thought DT is fighting for them and voted for him based on his rhetoric. Similarly, some of the so -called global left must have fallen for DJ’s real rhetoric about Castro and thought he is still a leftist. The obsession DJ has about Castro is very interesting. DJ always imagined that he is Sri Lankan Castro. According to his friends, now and then, he tries to have a beard and a cigar and sit in front of a mirror to enjoy his resemblance to Castro. You seem to have been taken in by someone posing as the real DJ!! Goodness – whoever faked DJ not just fooled gullible novice Arooran, but also the seasoned contributor Agnos. DJ (the real one) is smart. He will understand the message in the piece. No amount of showing off of the CV of Nee Hou Ma (books in sling bag or Falk’s review) will explain away the opportunistic political posturings we are used to seeing in Hou Ah Yu. No, it is the real Dayan Jayatilleka. It is shown by his Gravatar you can see in other threads, for instance under earlier articles by Sarath de Alwis; but the post is also consistent with his tactic for the past decade I have seen on CT, GV and other internet forums: when cornered, evade the point and just drop names. Well done, Agnos! The content-based inference you make is in fact more persuasive than the visual. But the converse seldom happens— People become fascists and/or issue fatwas like “Off with his head”. Non-linear theory may not explain it— How about a lesson in complex numbers? Is Thevaram’s mother of some kind of Sinhala origin? Sinhala origin? Just because she calls her son “putha”? (I read about her in an earlier post by Thevaram — look for the story of Sivakami’s tears, very much a Sri Lankan Tamil, I’d say). Many a Sinhala word has entered SL Tamil but not ‘putha’ or ‘duwa’. Putha comes from ‘putra’ in Sanskrit via Pali perhaps. (In Tamil it is ‘puththiran’, whose variants include ‘puthalvan’ etc.). The standard Tamil word is mahan whose Jaffna variant is ‘mOn’ (as in Malayalam) whereas the rude mavane belongs to Tamilnadu. Thanks — “putra” as the origin makes better sense. I guess the Jaffna mother using the word “putha” must be made-up, just in the interest of encouraging reconciliation between the communities. Niranjan pobably realises that half his readers are Sinhalese, and that HIS Tamil readers would know some Sinhalese. I believe that his own Sinhalese is excellent. I agree that “putra” may have been a reasonable compromise. Authenticity is desirable, but Niranjan must be accorded “poetic licence” because this is creative writing. Unfortunately few of us know any Tamil. DJ probably does, though. He was one of Vartharajah Peumal’s Ministers, ater all. What was his portfolio, I wonder? Please do not read too much meaning into everything that Prof N writes. Much of it is off the cuff. My comment was lighthearted in the same spirit as Prof N’s. As for Sinhalese knowing Tamil, I doubt if DJ known more than a Sinhalese trader in the north or east. Some speak better Tamil than their Tamil rivals. Is my call to ‘decapitate’ the guy in other threads a ‘fatwa’ and does that make me a ‘fascist’? Some people like this gigolo as well as Putin, the Rajapaksas and Assad, simply deserve it. They are the real fascists and war criminals, no matter what misguided people who call themselves leftists might say. The use of the “or” is an option, so you choose as you like. I leave the name calling to you– that is your patch, although not exclusively. We are talking about people who were cheerleaders for war crimes or executioners themselves–of mass killings, whether in Sri Lanka’s North and South or in other countries. 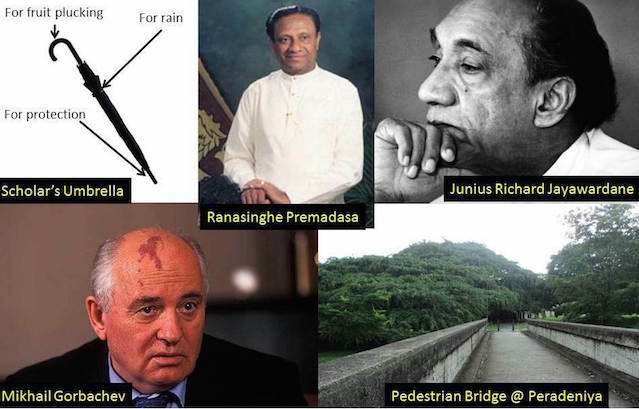 Sri Lankan war crimes in the North are a particular focus of mine, but I have spoken out against war crimes in the South under Premadasa as well. I decided long ago that social courtesies and niceties shouldn’t apply to the racists and war criminals; that on behalf of the victims, I would hound the criminals till their death in every forum possible. Hounding, demonizing, name-calling, etc. are the least that one can do to keep the need for justice alive. More so when prospects for justice via normal legal channels–local or international–are non-existent. 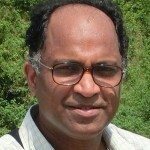 Isn’t it strange, Prof. Sivasegaran, that die-hard Marxists who gloss over mass killings and other crimes by their favorite autocrats on the cockamamie theory that they resist American imperialism, concern themselves with social niceties? This is pathetic– but please yourself. I am relieved that it is not yet off with my head. Pathetic? Maybe for your Marxist mind. My rational mind tells me that there is a lot of logic to it, but that is a long debate, so I will stop with this. 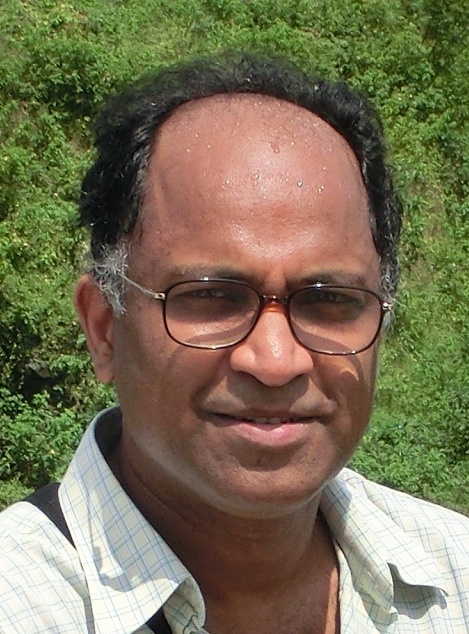 Sorry for my typo in your name, Prof. Sivasegaram. But the error is in the title. Some examples of where such actions successfully brought about justice might strengthen your position. The mere fact that you are taking about justice keeps the issue alive, doesn’t it? I said clearly the intent was to keep the issue alive, but actual justice is for others to handle. From Venezuela to Princeton,could it perhaps be….epigenetics asks Dayan.as usual with his tongue in his cheek. Could it perhaps be…. epileptics? Does the country need a leader who is better at killing the killers?